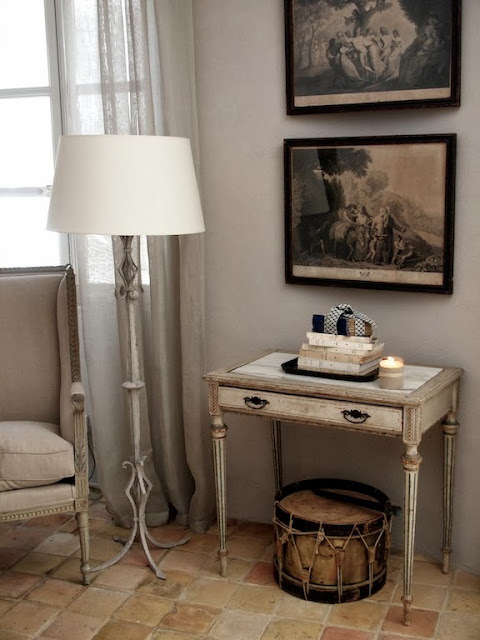 Lost in Arles: Win a week's stay in Provence at Le Petit Bijou! 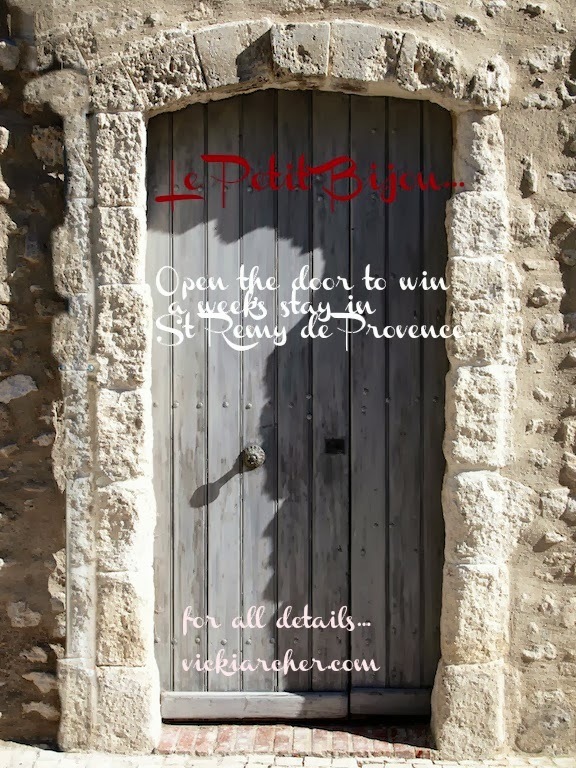 Win a week's stay in Provence at Le Petit Bijou! The lovely Vicki Archer, author and creator of the phenomenally successful blog, French Essence, has decided to celebrate her fifth blogoversary with an incredible giveaway. One lucky winner will be given a one-week stay at her village house rental, Le Petit Bijou, located right in the heart of St. Remy de Provence!!! Vicki is the real deal. She understands and offers up the dream of Provence better than anyone...because she lives it. 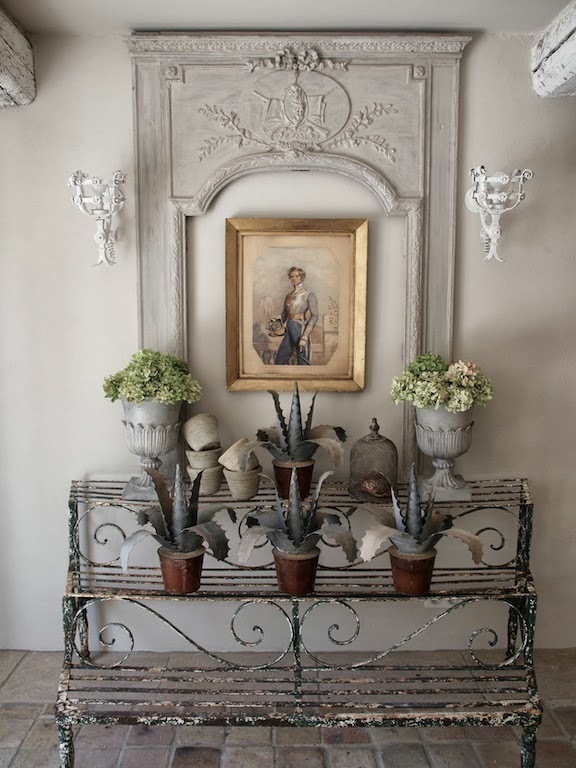 And all of that love for patina, the small but crucial details, suggestions to slow down and live the good life in a relaxed yet elegant setting...all of it has been put into Le Petit Bijou. It is the most beautiful rental of its kind that I know of in the Alpilles, if not all of Provence. Her generosity in this giveaway doesn't surprise me. For while she is known as being a taste-maker, always one step ahead of the pack (or three), anyone that has had the good fortune to spend time with her comes away being impressed by Vicki's kindness. She has always encouraged me and pushed me to go further with my own efforts--all while laughing over a good glass of rosé, of course! So what do you think? Can you imagine waking up in one of Provence's loveliest villages, having some coffee and fresh croissants on a balcony overlooking a sweet square before heading out to do a little exploring? Coming back for a little nap and then a nice apéro? 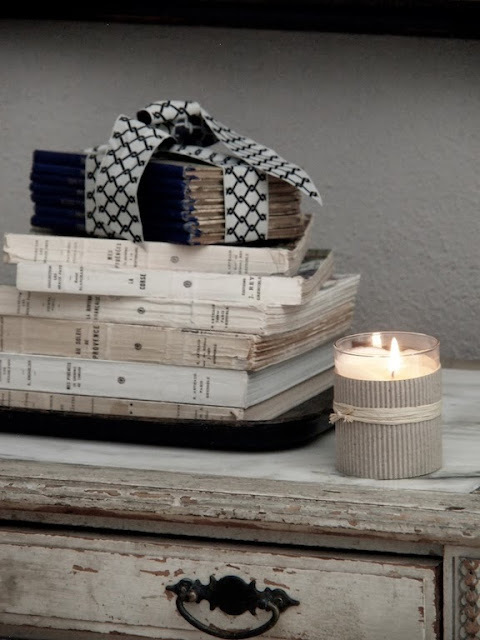 Curling up to read as the sun pours through the windows? Going to the market and coming back with a feast of Provencal delicacies? Sleeping like a Prince (or Princess!) just because you can? If so, then what are you waiting for? 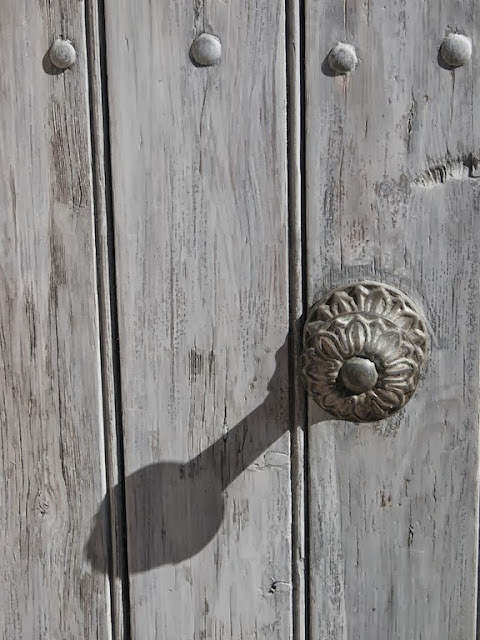 Open the door! To read more about the giveaway and to enter, please click here. And just think, if you win, you are only a twenty minute drive away from Arles, home to Ben and Kipling! To see more photos of Le Petit Bijou, click here and here. See? I told you it was amazing. As you can imagine, I am all over this. Wish me luck! Oh my gosh, I would be beyond psyched if you won!!!!! It would be a first. I don't think we'd want to leave. If only we could figure out a way to transport Karina (too many horror stories about dogs dying in the cargo area of the plane) we'd would like to come across, lease a car and travel around for a while. Why not? I do believe that there are wonderful doggy spas in the US. While not an option for a terribly long time, perhaps Karina would be ok with 10 days? Possibly? Oh she gets to stay with her friends Kola and/or Zoe when we go away. Its just a fantasy we have of living in Europe for a few months. But if I happened to win the week at Vicki's place, we'd have no problem hopping on a plane and leaving her home! Don't worry! Yum..and yummy! What a delightful dream for all who dream. What? You too are a dreamer..I just knew it...so come on along...let us share this one and maybe, just maybe, one of us will have the 'dream' come true! I entered for the giveaway! What a dream it would be to win. I've been to Provence once and definitely want to return. Yay Lorrie! It would be a long flight for you but so, so worth it!! Thats my GAL..........I was just saying how you use to talk about your evening aperitif, but not so often these past few months.Here you are slipping in that glass of ROSE.Love it!I hope YOU WIN!I know its only 20 minutes from your abode but wouldn't it be fun!I will do a little dance for you...................fingers and toes crossed! Oh don't you worry about me. L'apero is a nightly institution in these parts. I hope that you entered! Thanks for guiding us over! I'm totally entering!!! I need a vacation...and I would, love, love, love to meet you and the pups! Okay....I've seen all the photographs of "Le Petit Bijou" on your, Sharon's, and Vicki's blogs. As of today (and, trust me, I've visually SCOURED these pictures), I have yet to see a single ashtray......you know, the sort EVERY truly well-intentioned hostess sets out for the comfort of her guests and safety of her household? Where are people supposed to smoke up in there? Nor have I even glimpsed a single mini-bar or wall-mounted, flat-screen, 27" television (which is always so convenient after one has availed one's self of the mini-bar's comforts after lunch). And where is the entertainment-center and/or hot-tub-for-six (you never know whom you might make friends with in the neighborhood)? All I see are books (what's that about? ), some old&used pictures, obviously used furniture that's half-painted, and bare floors (I happen to know that you can get very lovely wall-to-wall carpeting for low pirces these days; I scord a big deal last year and happily installed it throught my entire house). Even the lamps look like they belonged to someone else before they wound up in this place. Oh....There's not a bug-zapper to be seen....so, you can bet the place is chock-a-block with mosquitoes and bugs. Also?...There's no game-console device, as far as I can see. What is person supposed to DO there, I wonder? Spend everyday walking aimlessly around that forlorn village, hoping to find someone who can speak English, like normal people do? Is there even a halfway decent sportsbar in that place? It's all restaurants and cafes that you've never heard of. My personal opinion is that, if a restaurant is any good, then it gets to open in lots of other places. That's how you know it's good. What do people DO at night (or in the daytime, for that matter) in that place? Are there any outlet-stores around St. Remy (I can't figure this out)? Once again, what is someone supposed to DO once you get there?I just looked it up on the internet, and nothing in St. Remy does Group-on. That says a lot to me. Well...I'm not going to be entering this drawing. I'm too smart to get pulled into this one. Well, I owe you an apology. After reading your pointed response, I took a second look at the photos that I posted (note that I did not take these myself but rather just used them in good faith, kind of like folks do on Pinterest) and it would appear that you have reason to be concerned. For example, in the second photo, those books seem to be in French. Well, obviously they might as well be in Chinese for the lots of goods that does. In the next photo down...those plants? They aren't even real plants but are made out of steel or something! And worse, in the next photo, it looks like the only surround sound is supplied by some old drum. I mean, I know that France is an olde country and all but hello? We do have at least radio internets in these parts. I am sure that Vicki simply didn't see that the furniture has chipped paint. You know, she just opened this rental so maybe this is just some stuff she had lying around until she can buy some new stuff? But then again, she is Australian and perhaps they have different standards down there? I will also ask her about what sporting options and events are available to guests in St. Remi. As your question about what people do at night, well, I don't appreciate the tone of that question and will just let it be forgotten. That aside, I do have some rather promising information for yous. I am VERY proud to say that we have not one but TWO McDonald's in Arles where I live. St. Remi is just a peasant town really so you can't expect them to have such internationally established establishments. Sadly, there is no Hooters in France yet. As for the lack of television, um, I don't know how esle to say this but...it is called an iped, Mr. Sperry. I would be surprised that someone of your standing didn't have one allready. That would take care of the games too. And there ARE outlet stores here, they just have a weird name for it (like they do everything). They are called brocantes. I know, I can't explain it either. But I do hope that you will reconsider this one time promotional offer. And if you have any further questions or concerns, by all means, hesitate. Oh, thank you, Vicki......I do love (I just read it) your "convicts and all" remark. Surely you've had to deal with folks who assume that all Australians talk like the escaped convict at the start of "Great Expectations"? The weirdest damned thing is that only Australians I've had anything whatsoever to do with are dauntingly worldly (by my admittedly small-town, Tennessee standards) folks like you, & your husband, Rupert Murdoch, Geraldine Brooks, Robert Hughes, Carla Coulson, etcetera....and let's not forget the fellow who got Americans to cough up MILLIONS of dollars for him to play the stereotype of "Crocodile Dundee" (the guy is nobody's dummy). That said?.....the fact remains that "Le Petit Bijou" is way too pretty and too clean for me to ever think of spending even one night there.....but, Vicki, youare going to make someone very happy when this give-away is finished. Herve and I will just have to bunk-up in the nearest Best-Western when we next visit St. Remy. Oddly enough, "Best Westerns" aren't at all bad in France, for some reason....we stayed in a really lovely, 17th century one (the building; not the franchise)at the foot of the castle at Chinon two Christmas's ago. And no mention of my rather laborious tongue in cheek response, David? I guess I am no good at funny after all! Oh, Heather.....you'll be getting your response. For now?...I thought the brilliant touch, given your stance as a concerned Arlessienne, was getting my danged NAME wrong. "Mr Sperry", indeed. Anne Mah's "Mastering the Art of French Eating' (which you recommended in a recent post) came in the post yesterday. I read a bit last night and a bit today. I was ten pages into it and thought "Heather's right....this is a book you could just gulp down in one sitting while dinner burns in the kitchen and the dogs go unwalked this evening....."
It's wonderful. I'm allotting myself no more than twenty or so pages per sitting. Doesn't she have a singular/unique tone?.....somewhere between factual and wryly-observant and sincerely curious and (most appealingly, to me at least) quite straightforward in making it clear that none of her experience was a tourist-y cakewalk. Well, it's a wonderful book. Thank you for the recommendation. I just got my copy from the library. Can't wait to dig in! Judith, you will love it. David, I agree with your thoughts on her tone--and I had been trying to break it down myself. For me, I am so impressed that she manages to be such a good food writer, travel writer and journalist (each un metier in itself) all while being so moving. I think that it is going to become a classic of its genre. Your 'yous' and 'iped' make me wonder if your Aussie Vicki has been teaching youse how to speak like her cozzie bros across the ditch http://www.youtube.com/watch?v=lm9Ez_5LQNU But, oh how lovely, it would be to spend some time in her beautiful bijou. I hope that you entered!!!! Sorry about the faulty video. I was probably laughing at it too much and failed to link it properly.